• The book The Huffington Post called "one of the greatest literary debuts in recent history"
The future of democracy is about to implode. In the newly-incorporated DarFur, a governor dies in a fiery explosion. In Geneva, a superpower hatches plans to bring microdemocracy to its knees. In Central Asia, a sprawling war among archaic states threatens to explode into a global crisis. And across the world, a shadowy plot is growing, threatening to strangle Information with the reins of power. MALKA OLDER is a writer, humanitarian worker, and PhD candidate at the Centre de Sociologie des Organisations studying governance and disasters. Named Senior Fellow for Technology and Risk at the Carnegie Council for Ethics in International Affairs for 2015, she has more than eight years of experience in humanitarian aid and development, and has responded to complex emergencies and natural disasters in Uganda, Darfur, Indonesia, Japan, and Mali. 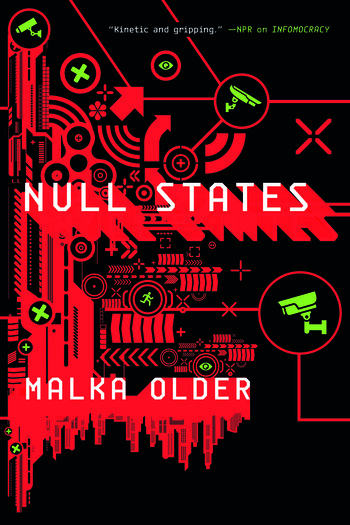 Her debut novel was 2016's Infomocracy.